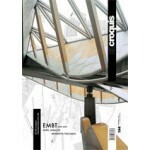 Packaged in a new, soft, flexi-bind jacket, El Croquis provides a survey of almost a decade output built since Miralles passed away in July 2000. 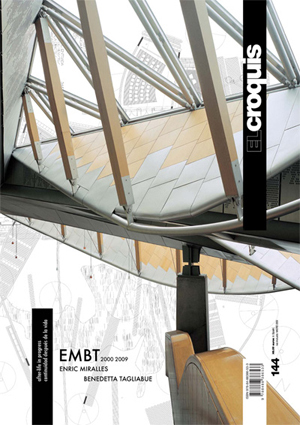 Introduced by essays from Mark Wigley and Juan Antonio Cortés, the issue features seven works and projects – all elaborately documented through full-colour photographs, technical drawings, plans, models, elevations and introductory texts. 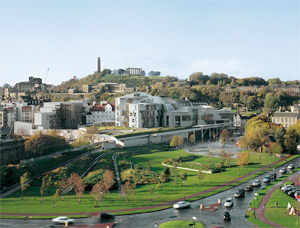 Included are the partnership’s Utrecht Town Hall renovations in The Netherlands; the Vigo University Campus, Pontevedra; their renovation of the Santa Caterina Market, Barcelona; the Scottish Parliament, Scotland; and the Palafolls Public Library, Barcelona. 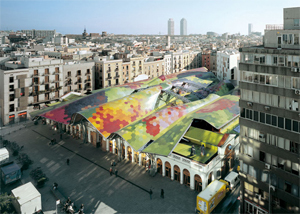 The survey is concluded by an informative interview with, and an essay by, Benedetta Tagliabue.